Definition at line 19 of file StrandCoord.h. Definition at line 17 of file StrandCoord.cc. Definition at line 21 of file StrandCoord.cc. Definition at line 33 of file StrandCoord.cc. References kidId, pid, Ipc::TypedMsgHdr::putPod(), Ipc::TypedMsgHdr::putString(), and tag. Referenced by Ipc::StrandSearchResponse::pack(), and Ipc::HereIamMessage::pack(). Definition at line 26 of file StrandCoord.cc. References Ipc::TypedMsgHdr::getPod(), Ipc::TypedMsgHdr::getString(), kidId, pid, and tag. Referenced by Ipc::HereIamMessage::HereIamMessage(), and Ipc::StrandSearchResponse::StrandSearchResponse(). Definition at line 29 of file StrandCoord.h. Referenced by Ipc::Coordinator::handleRegistrationRequest(), Ipc::Strand::handleRegistrationResponse(), LesserStrandByKidId(), Ipc::Coordinator::notifySearcher(), IpcIoFile::openCompleted(), pack(), Ipc::Coordinator::registerStrand(), and unpack(). Definition at line 30 of file StrandCoord.h. Referenced by Ipc::Strand::handleRegistrationResponse(), pack(), and unpack(). Definition at line 32 of file StrandCoord.h. 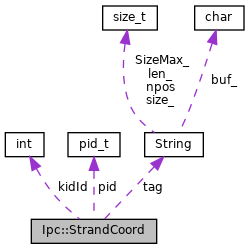 Referenced by IpcIoFile::HandleOpenResponse(), IpcIoFile::open(), pack(), Ipc::Coordinator::registerStrand(), and unpack().